Helmi Vent [LIA - Lab Inter Arts] - "Please Take a Seat" Helmi Vent [LIA - Lab Inter Arts] - "Please Take a Seat"
It was bizarre, insect-like creatures that first appeared on the stage of the large studio: dancers (or gymnasts) hidden like snails under a shell of chairs, crawling like beetles under their protective armor or hovering like dragonflies with wings made of – chairs. The chair as the leitmotiv for an idiosyncratic performance lasting about 40 minutes; the theme: "Please take a seat" . For the second part of the evening, Helmi Vent had staged a group composition that abounded with humorous ideas. 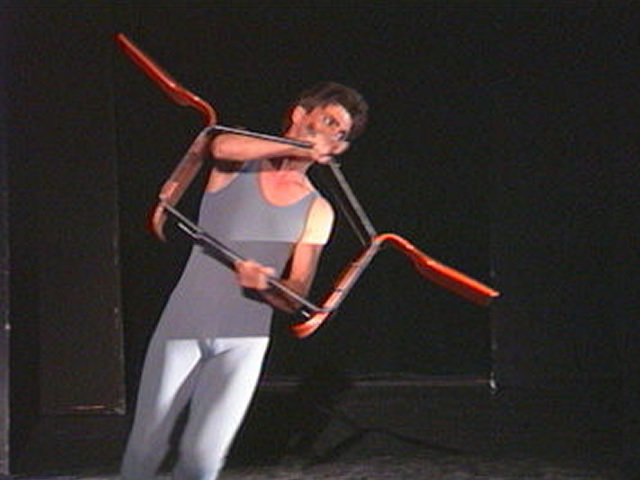 The integration of chairs into this scenic performance, which told the story of both the discovery and the conquest of the chair as something to sit on, involved a wide variety of striking effects. The Orff ensemble imaginatively demonstrated how versatile chairs can be: from a ball to an airplane to a wormlike creature crawling slowly and deliberately across the stage, the scenarios they developed out of this everyday object gave the audience the gift of amusement as well as food for thought.